This photograph was taken along the shore of the Marco River from Marco Island, Florida. I established myself in this vantage point well before dawn and set up a tripod-mounted Fuji X-T1 mirrorless compact camera with a Fujinon 18-55mm zoom lens, 10X neutral density filter and an electronic shutter release. The effect of the smooth, flowing water is achieved by leaving the camera’s shutter open for a long time (requiring the tripod mounting and the neutral density filter; even at this early time in the day). I love making long exposure photographs. You’ll find other examples of them here on my web site including numerous images of waterfalls in upstate New York and another river image...a study looking across the East River at the NYC skyline. The sunrise this particular morning was as vivid and saturated in color as pictured here. The color was shifted slightly from it’s natural color by manually adjusting the white balance setting on the camera. All of my highly collectible fine art photography editions are available for acquisition artist direct as well as through the various fine art photography galleries that represent my body of work. 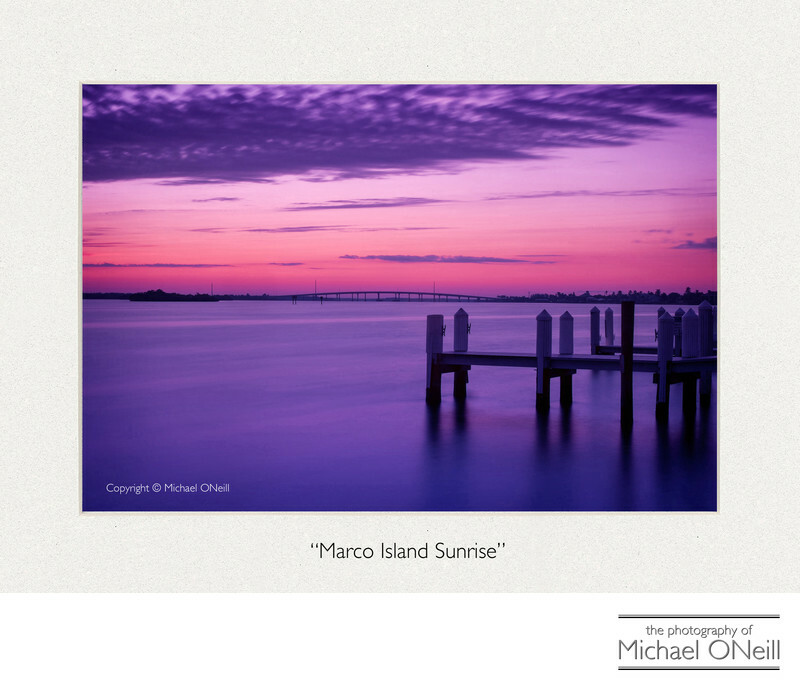 I’ve already sold a handful of this edition to collectors...all of whom reside right here on Marco Island, FL. This is only one of two Florida images in my collection as of this writing but I fully intend to add more during my upcoming, somewhat regular, visits to The Sunshine State.